A hidden spiritual power permeates the land around us, and those of us who are willing to open up to it can access and feel it. I’ve just started to tap into it, and I feel it in its strongest doses when I’m in nature. I’ve only received an inkling of the spiritual power that flows from this land, but from what I’ve felt so far, it’s incredibly potent. I’m sure it’ll eventually uplift those who’ve been lost in unawareness for too long to really feel or understand it, and when it does, we’ll finally see how badly we’ve hurt the earth. My intuition tells me that this hidden spiritual power is love, which is a force that most people are unaware of in a greater sense and unwilling to pursue with any degree of seriousness. It’s obvious to some seekers that love is the most powerful force in existence, and it could very well be the indescribable power that’s starting to reach us. Whatever this power is, it’s worth our attention. It’s worth focusing on, because it has something to offer us – something we can use to find a higher state of consciousness and simultaneously remember that taking care of our planet is important. The problem with anything that takes place on the spiritual side of the veil is that it’s often difficult to describe, and this power’s one of the hardest things I’ve ever tried to describe. I do know that it’s pure, however, and everyone would benefit from tapping in to it. The sooner we can all access this latent spiritual power; this indescribable yet uplifting energy, the sooner we can understand it for what it really is. I don’t know what it is quite yet, but I know it’s real, it’s here, and it has something to offer us. I’d imagine it intends to offer peace, harmony, an expanded understanding ourselves as spiritual beings, and/or a renewed grasp on the importance of treating this planet with the love, care and respect it deserves. I don’t know, but it’s quite an uplifting energy. I feel like a new day is on the horizon, and I know a lot of people have felt this way for a long time. But the feeling’s hitting me differently than usual. I feel like the negative aspects of our collective consciousness that have raged for centuries are slowly dying and giving way to a new aspect; a higher aspect; something purer that’ll eventually affect everyone positively. Something’s happening here on earth, and the forces of nature have a lot to do with it. A lot of people have told us that connecting with nature is one of the best way to attune to our inner perception or connect with our Christ consciousness, and there seems to be a lot of truth to this idea – especially right now. I could say ‘the energies are really intense right now’ as usual, but I feel like whatever’s happening goes beyond this. I think it’s deeper than an amplification of the energies we’re receiving from various parts of the cosmos. Sure, these energies could play a part, but I don’t think they’re the sole cause. I think there’s a force, either deep within the earth or swirling all around it, that’s ready for things to change. There’s a force that’s ready to see collective peace, harmony, balance and a reconnection with nature, and this spiritual force will inundate us with memories of a time when we once freely and harmoniously connected with spirit and the earth’s beautiful nature. I think there was once a time when we weren’t racked with darkness or disharmony. There was a time when everyone lived in peace and unity – with each other and the plant and animal kingdoms – and no self-serving interests sought to ravage our planet’s riches for personal or industrial gain. I don’t think this time was as far in the past as some seekers think, but it dates back further than our recorded history. Even still, it feels like it was only a moment ago. It’s such a difficult thing to describe or even grasp. I always visit different nature spots around my home, and I always get the feeling that somehow, in some way, things were once different; more harmonious; more spiritual; more lively, loving, unitive, and heavenly. The biggest feeling I get is that we’ve already experienced heaven on earth once, and we’re getting ready to experience it again. I get an almost nagging feeling that this world was once a lot heavenlier than it is now, and we were all a part of its heavenliness. We all enjoyed a utopian planet where greed and disharmony practically didn’t exist. This sounds like one of the most naïve things you could say to most people today, but I feel it in the deepest depths of my soul. Something strong and pure was once here, and we can resurrect it. Our society’s been lost in darkness and self-service for what seems like millennia, but we’re being offered an opportunity to change things; to heal and restore them, and in doing so, heal and restore ourselves. Whatever powerful, loving energy can be felt in nature will help us restore our planet. I think this energy was once common, but it’s since depleted as humanity sought to control the earth instead of living in harmony with it and its creatures. An ancient power once roamed this land, and it was right out in the open. I don’t think it was hidden or suppressed in any way, and in fact, we might’ve celebrated it. We might’ve seen it as the greatest creative and spiritual source we could attain, and we might’ve guarded it closely. We might’ve taken any measure we could to make sure this power was never disrupted or depleted, but we faltered somewhere along the way. At some point, we made a mistake and depleted this energy as we fell into unawareness and abandoned harmony in favor of using our earth selfishly. It’s clear to anyone who looks at the past couple hundred years of our history that humanity’s been almost comically greedy with our resources. We treat plants and animals like useless commodities that we can do whatever we want with instead of respecting and loving them, and we basically do the same thing with everything else. Our disregard for our planet and its sentient creatures has caused a lot of environmental destruction, which could do us in if we aren’t careful, but as strange or naïve as it sounds, I think all of that’s starting to dissipate. I think this spiritual power will have a lot to do with the dissipation of our selfishness and unawareness, and I think it’ll subtly lead everyone to consider that we can embrace new way of life – a way of life we willingly embraced when the earth was rooted in a higher vibration. I get the increasing feeling that utopia once existed here on earth and will again, and I think this power will eventually reach the minds and hearts of those who’ve hurt the earth without any remorse or any thought of what their selfishness could cause down the line. Most belief systems preach that a major planetary change of some sort will occur, and some religions are a little softer about it than others. Some religions tell us the earth will be destroyed as ‘saints’ ascend to heaven and ‘sinners’ experience hell on earth, and some tell us that something big will happen that’ll cause us to create heaven for ourselves. Rastafarians believe Africa is heaven, for example, and those who’ve maintained love and righteousness will return to Africa one day and enjoy eternal life and heaven on earth. 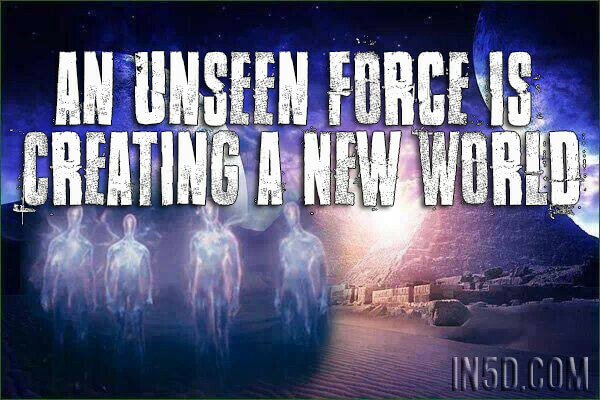 The ‘new age’ movement is based on the idea that dramatic shifts in consciousness will lead everyone to ascend into the fifth dimension and experience an earthly heaven. No matter what belief system you look at, there seems to be a mutual belief that life as we currently know it won’t continue. Depending on the religion, it’ll either be replaced with destruction and an ascension on the part of people who’ve behaved, a gaining of consciousness and a collective creation of heaven on earth, or a range of other scenarios. Personally, the idea that the ‘good’ religious people will leave earth and go to heaven and the ‘sinners’ will leave earth for hell (or experience hell on earth) doesn’t resonate with me at all. I think the earth is and has always been heavenly, but the actions of man have turned it hellish. I resonate much more with the idea that all of humanity – not a specific group of people – will respond to this powerful energy and construct a utopian society, all the while living in alignment with certain philosophies. I don’t refer to philosophies that are taught in some church or written in some book, but philosophies that are based in love, unity and, most importantly, common sense. Keeping the earth healthy and refusing to pollute it (especially for personal gain) should seem like common sense, but unfortunately, selfish interests have ravaged it for centuries. I don’t think this’ll continue as this energy starts to influence more and more people, and even the wickedest among us will be given an opportunity to see the light and work toward healing the earth of the destruction we’ve caused. Major changes are inevitable, and when they finally start to happen, I’d imagine this powerful force will have something to do with it. Our response to this force will determine what’s done to heal this planet, and this is why it’s important for those of us who feel it to act on it. I wish I could outline what I’m feeling in a clearer or more sophisticated way, but nothing I say will do justice to exactly what this feels like. The best and simplest thing I can say is that it’s time to create earthly heaven, and I think our motivation to create it will grow as more people open up and respond to this force with the same inspiration and enthusiasm as the seekers who are ready to make some changes. I can only hope this happens, at least, because the alternative to utopia is most certainly destruction. I only say this because of how badly we’ve hurt the environment, and like I’ve said before, there are only two directions we can take from here: up or down. We can’t continue to hurt the earth and expect to sustain ourselves for much longer, and I support the idea that we’re here to use awareness and common sense to bring our planet back into the heavenly states of consciousness we all inhabited at one time. I’m ready to do whatever I can to contribute to our earthly heaven, and more people will hopefully say the same in a time when consciousness has grown and everyone recognizes how malevolent the environmental destruction our greed has caused truly is.